Create magical moments by ordering online this Wonderful Designed Spider Man Stationery Set for your loved ones and spread your warm feelings into their hearts. 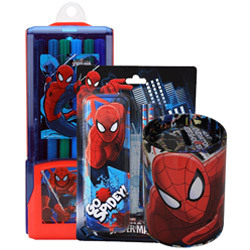 This Stationery Set contains Multi Color Spider Man Designed Stationery Set, Color Pen Set of 12 and Coin Bank. Its features include Easy to Carry, comes in bright Refreshing Colors, made of Best Quality Fiber to ensures Longer Usability, Easy N Smoother to Use, Durable with No Toxic Effect, Pen Set comes in Stylish Plastic Case and Easy to Carry while Travelling.